Android 7.0 Nougat introduces a variety of new features and capabilities for users and developers. This document highlights what's new for developers. Make sure check out the Android 7.0 behavior changes to learn about areas where platform changes may affect your apps. To learn more about the consumer features of Android 7.0, visit www.android.com. In Android 7.0, we're introducing a new and much-requested multitasking feature into the platform — multi-window support. Users can now pop open two apps on the screen at once. On phones and tablets running Android 7.0, users can run two apps side-by-side or one-above-the-other in splitscreen mode. Users can resize the apps by dragging the divider between them. On Android TV devices, apps can put themselves in picture-in-picture mode, allowing them to continue showing content while the user browses or interacts with other apps. Figure 1. Apps running in split-screen mode. Especially on tablets and other larger-screen devices, multi-window support gives you new ways to engage users. You can even enable drag-and-drop in your app to let users conveniently drag content to or from your app — a great way to enhance your user experience. It's straightforward to add multi-window support to your app and configure how it handles multi-window display. For example, you can specify your activity's minimum allowable dimensions, preventing users from resizing the activity below that size. You can also disable multi-window display for your app, which ensures that the system will only show your app in full-screen mode. For more information, see the Multi-Window Support developer documentation. Template updates: We're updating notification templates to put a new emphasis on hero image and avatar. Developers will be able to take advantage of the new templates with minimal adjustments in their code. Messaging style customization: You can customize more of the user interface labels associated with your notifications using the MessagingStyle class. You can configure the message, conversation title, and content view. Bundled notifications: The system can group messages together, for example by message topic, and display the group. A user can take actions, such as Dismiss or Archive, on them in place. If you’ve implemented notifications for Android Wear, you’ll already be familiar with this model. Direct reply: For real-time communication apps, the Android system supports inline replies so that users can quickly respond to an SMS or text message directly within the notification interface. Custom views: Two new APIs enable you to leverage system decorations, such as notification headers and actions, when using custom views in notifications. Figure 2. Bundled notifications and direct reply. To learn how to implement the new features, see the Notifications guide. In Android 7.0, we've added a Just in Time (JIT) compiler with code profiling to ART, which lets it constantly improve the performance of Android apps as they run. The JIT compiler complements ART's current Ahead of Time (AOT) compiler and helps improve runtime performance, save storage space, and speed up app updates and system updates. Profile-guided compilation lets ART manage the AOT/JIT compilation for each app according to its actual usage, as well as conditions on the device. For example, ART maintains a profile of each app's hot methods and can precompile and cache those methods for best performance. It leaves other parts of the app uncompiled until they are actually used. Besides improving performance for key parts of the app, profile-guided compilation helps reduce an app's overall RAM footprint, including associated binaries. This feature is especially important on low-memory devices. ART manages profile-guided compilation in a way that minimizes impact on the device battery. It does precompilation only when then the device is idle and charging, saving time and battery by doing that work in advance. One of the most tangible benefits of ART's JIT compiler is the speed of app installs and system updates. Even large apps that required several minutes to optimize and install in Android 6.0 can now install in just a matter of seconds. System updates are also faster, since there's no more optimizing step. 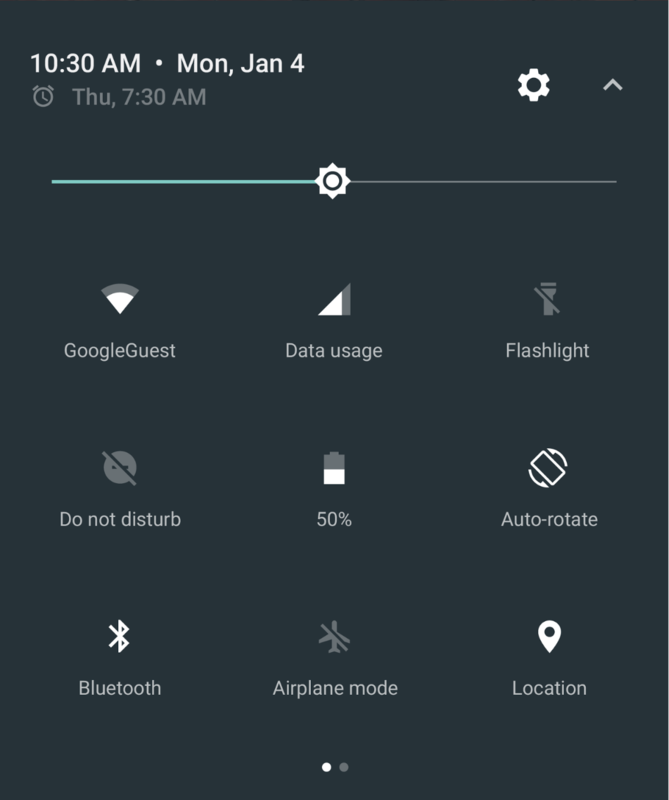 Android 6.0 introduced Doze, a system mode that saves battery by deferring apps' CPU and network activities when the device is idle, such as when it's sitting on a table or in a drawer. Now in Android 7.0, Doze takes a step further and saves battery while on the go. Any time the screen is off for a period of time and the device is unplugged, Doze applies a subset of the familiar CPU and network restrictions to apps. This means users can save battery even when carrying their devices in their pockets. Figure 3. Doze now applies restrictions to improve battery life even when the device is not stationary. A short time after the screen turns off while the device is on battery, Doze restricts network access and defers jobs and syncs. During brief maintenance windows, applications are allowed network access and any of their deferred jobs/syncs are executed. Turning the screen on or plugging in the device brings the device out of Doze. When the device is stationary again, with screen off and on battery for a period of time, Doze applies the full CPU and network restrictions on PowerManager.WakeLock, AlarmManager alarms, and GPS/Wi-Fi scans. The best practices for adapting your app to Doze are the same whether the device is moving or not, so if you already updated your app to gracefully handle Doze, you're all set. If not, start adapting your app to Doze now. Project Svelte is an ongoing effort to minimize RAM use by system and apps across the range of Android devices in the ecosystem. In Android 7.0, Project Svelte is focused on optimizing the way apps run in the background. Background processing is an essential part of most apps. When handled right, it can make your user experience amazing — immediate, fast, and context-aware. When not handled right, background processing can needlessly consume RAM (and battery) and affect system performance for other apps. Since Android 5.0, JobScheduler has been the preferred way of performing background work in a way that's good for users. Apps can schedule jobs while letting the system optimize based on memory, power, and connectivity conditions. JobScheduler offers control and simplicity, and we want all apps to use it. Another good option is GCMNetworkManager, part of Google Play Services, which offers similar job scheduling with compatibility across legacy versions of Android. We're continuing to extend JobScheduler and GCMNetworkManager to meet more of your use cases — for example, in Android 7.0 you can now schedule background work based on changes in Content Providers. At the same time we're starting to deprecate some of the older patterns that can reduce system performance, especially on low-memory devices. In Android 7.0 we're removing three commonly-used implicit broadcasts — CONNECTIVITY_ACTION, ACTION_NEW_PICTURE, and ACTION_NEW_VIDEO — since those can wake the background processes of multiple apps at once and strain memory and battery. If your app is receiving these, take advantage of the Android 7.0 to migrate to JobScheduler and related APIs instead. Take a look at the Background Optimizations documentation for details. Android 7.0 brings synchronous movement to the SurfaceView class, which provides better battery performance than TextureView in certain cases: When rendering video or 3D content, apps with scrolling and animated video position use less power with SurfaceView than with TextureView. The SurfaceView class enables more battery-efficient compositing on screen, because it is composited in dedicated hardware, separately from app window content. As a result, it makes fewer intermediate copies than TextureView. A SurfaceView object's content position is now updated synchronously with the containing app content. One result of this change is that simple translations or scales of a video playing in a SurfaceView no longer produce black bars alongside the view as it moves. Starting with Android 7.0, we strongly recommend that you save power by using SurfaceView instead of TextureView. Figure 4. Data Saver in Settings. Over the life of a mobile device, the cost of a cellular data plan typically exceeds the cost of the device itself. For many users, cellular data is an expensive resource that they want to conserve. 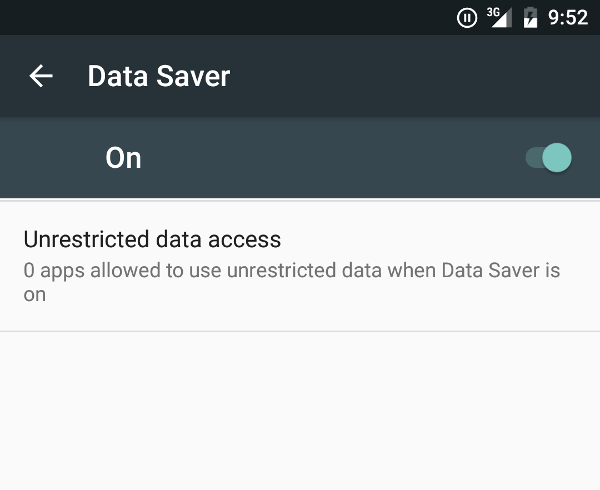 Android 7.0 introduces Data Saver mode, a new system service that helps reduce cellular data use by apps, whether roaming, near the end of the billing cycle, or on a small prepaid data pack. Data Saver gives users control over how apps use cellular data and lets developers provide more efficient service when Data Saver is on. When a user enables Data Saver in Settings and the device is on a metered network, the system blocks background data usage and signals apps to use less data in the foreground wherever possible — such as by limiting bit rate for streaming, reducing image quality, deferring optimistic precaching, and so on. Users can whitelist specific apps to allow background metered data usage even when Data Saver is turned on. Android 7.0 extends the ConnectivityManager to provide apps a way to retrieve the user's Data Saver preferences and monitor preference changes. All apps should check whether the user has enabled Data Saver and make an effort to limit foreground and background data usage. Android 7.0 integrates Vulkan™, a new 3D rendering API, into the platform. Like OpenGL™ ES, Vulkan is an open standard for 3D graphics and rendering maintained by the Khronos Group. Vulkan is designed from the ground up to minimize CPU overhead in the driver, and allow your application to control GPU operation more directly. Vulkan also enables better parallelization by allowing multiple threads to perform work such as command buffer construction at once. Vulkan is only available to apps on devices with Vulkan-capable hardware, such as Nexus 5X, Nexus 6P, and Nexus Player. We're working closely with our partners to bring Vulkan to more devices as soon as possible. Figure 5. Quick Settings tiles in the notification shade. Quick Settings is a popular and simple way to expose key settings and actions, directly from the notification shade. In Android 7.0, we've expanded the scope of Quick Settings to make it even more useful and convenient. We've added more room for additional Quick Settings tiles, which users can access across a paginated display area by swiping left or right. We've also given users control over what Quick Settings tiles appear and where they are displayed — users can add or move tiles just by dragging and dropping them. For developers, Android 7.0 also adds a new API that lets you define your own Quick Settings tiles to give users easy access to key controls and actions in your app. Quick Settings tiles are reserved for controls or actions that are either urgently required or frequently used, and should not be used as shortcuts to launching an app. Once you’ve defined your tiles, you can surface them to users, who can add them to Quick Settings just by drag and drop. For information about creating an app tile, see the reference documentation for Tile. Android 7.0 now supports number blocking in the platform and provides a framework API to let service providers maintain a blocked-number list. The default SMS app, the default phone app, and carrier apps can read from and write to the blocked-number list. The list is not accessible to other apps. Additionally, carrier app integration through Android means that carriers can read the blocked numbers list on the device and perform service-side blocking for the user in order to stop unwanted calls and texts from reaching the user through any medium, such as a VOIP endpoint or forwarding phones. For more information, see the reference documentation for BlockedNumberContract. For more information, see the reference documentation for CallScreeningService. Android 7.0 now lets users select multiple locales in Settings, to better support bilingual use-cases. Apps can use a new API to get the user's selected locales and then offer more sophisticated user experiences for multi-locale users — such as showing search results in multiple languages and not offering to translate webpages in a language the user already knows. Along with multi-locale support, Android 7.0 also expands the range of languages available to users. It offers more than 25 variants each for commonly used languages such as English, Spanish, French, and Arabic. It also adds partial support for more than 100 new languages. Apps can get the list of locales set by the user by calling LocaleList.GetDefault(). To support the expanded number of locales, Android 7.0 is changing the way that it resolves resources. Make sure that you test and verify that your apps working as expected with the new resource resolution logic. To learn about the new resource-resolution behavior and the best practices you should follow, see Multilingual Support. Android 7.0 introduces additional emojis and emoji-related features including skin tone emojis and support for variation selectors. If your app supports emojis, follow the guidelines below to take advantage of these emoji-related features. Check that a device contains an emoji before inserting it. To check which emojis are present in the system font, use the hasGlyph(String) method. Check that an emoji supports variation selectors. Variation selectors allow you to present certain emojis in color or in black-and-white. On mobile devices, apps should represent emojis in color rather than black-and-white. However, if your app displays emojis inline with text, then it should use the black-and-white variation. To determine whether an emoji has a variation, use the variation selector. For a complete list of characters with variations, review the emoji variation sequences section of the Unicode documentation on variations. Check that an emoji supports skin tone. Android 7.0 allows users to modify the rendered skin tone of emojis to their preference. Keyboard apps should provide visual indications for emojis that have multiple skin tones and should allow users to select the skin tone that they prefer. To determine which system emojis have skin tone modifiers, use the hasGlyph(String) method. You can determine which emojis use skin tones by reading the Unicode documentation. Android 7.0 now offers a subset of ICU4J APIs in the Android framework under the android.icu package. Migration is easy, and mostly entails simply changing from the com.java.icu namespace to android.icu. If you are already using an ICU4J bundle in your apps, switching to the android.icu APIs provided in the Android framework can produce substantial savings in APK size. To learn more about the Android ICU4J APIs, see ICU4J Support. Starting with Chrome version 51 on Android 7.0 and above, the Chrome APK on your device is used to provide and render Android System WebViews. This approach improves memory usage on the device itself and also reduces the bandwidth required to keep WebView up to date (as the standalone WebView APK will no longer be updated as long as Chrome remains enabled). You can choose your WebView provider by enabling Developer Options and selecting WebView implementation. You can use any compatible Chrome version (Dev, Beta or Stable) that is installed on your device or the standalone Webview APK to act as the WebView implementation. Starting with Chrome version 51 in Android 7.0, WebView will run web content in a separate sandboxed process when the developer option "Multiprocess WebView" is enabled. We're looking for feedback on compatibility and runtime performance in N before enabling multiprocess WebView in a future version of Android. In this version, regressions in startup time, total memory usage and software rendering performance are expected. If you find unexpected issues in multiprocess mode we’d like to hear about them. Please get in touch with the WebView team on the Chromium bug tracker. Starting with apps targeting Android 7.0, the geolocation API will only be allowed on secure origins (over HTTPS.) This policy is designed to protect users’ private information when they’re using an insecure connection. WebView is updated regularly, so we recommend that you test compatibility with your app frequently using WebView’s beta channel. To get started testing pre-release versions of WebView on Android 7.0, download and install either Chrome Dev or Chrome Beta, and select it as the WebView implementation under developer options as described above. Please report issues via the Chromium bug tracker so that we can fix them before a new version of WebView is released. All extensions from the Android Extension Pack (AEP) except for EXT_texture_sRGB_decode. Floating-point framebuffers for HDR and deferred shading. BaseVertex draw calls to enable better batching and streaming. Robust buffer access control to reduce WebGL overhead. The framework API for OpenGL ES 3.2 on Android 7.0 is provided with the GLES32 class. When using OpenGL ES 3.2, be sure to declare the requirement in your manifest file, using the <uses-feature> tag and the android:glEsVersion attribute. For information about using OpenGL ES, including how to check a device's supported OpenGL ES version at runtime, see the OpenGL ES API guide. Android 7.0 adds the ability to record and playback content from Android TV input services via new recording APIs. Building on top of existing time-shifting APIs, TV input services can control what channel data can be recorded, how recorded sessions are saved, and manage user interaction with recorded content. For more information, see Android TV Recording APIs. Android for Work adds many new features and APIs for devices running Android 7.0. Some highlights are below — for a complete list of changes, see Android for Work Updates. Profile owners targeting the N SDK can specify a separate security challenge for apps running in the work profile. The work challenge is shown when a user attempts to open any work apps. Successful completion of the security challenge unlocks the work profile and decrypts it if necessary. For profile owners, ACTION_SET_NEW_PASSWORD prompts the user to set a work challenge, and ACTION_SET_NEW_PARENT_PROFILE_PASSWORD prompts the user to set a device lock. Profile owners can set distinct passcode policies for the work challenge (such as how long the PIN needs to be, or whether a fingerprint can be used to unlock the profile) using the setPasswordQuality(), setPasswordMinimumLength() and related methods. The profile owner can also set the device lock using the DevicePolicyManager instance returned by the new getParentProfileInstance() method. Additionally, profile owners can customize the credentials screen for the work challenge using the new setOrganizationColor() and setOrganizationName() methods. On a device with a work profile, users can toggle work mode. When work mode is off the managed user is temporarily shut down, which disables work profile apps, background sync, and notifications. This includes the profile owner application. When work mode is off, the system displays a persistent status icon to remind the user that they can't launch work apps. The launcher indicates that work apps and widgets are not accessible. Device owners and profile owners can ensure that work apps always connect through a specified VPN. The system automatically starts that VPN after the device boots. New DevicePolicyManager methods are setAlwaysOnVpnPackage() and getAlwaysOnVpnPackage(). Because VPN services can be bound directly by the system without app interaction, VPN clients need to handle new entry points for Always on VPN. As before, services are indicated to the system by an intent filter matching action android.net.VpnService. Users can also manually set Always on VPN clients that implement VPNService methods using Settings>More>Vpn. The option to enable Always on VPN from Settings is available only if VPN client targets API level 24. An application can customize the profile owner and device owner provisioning flows with corporate colors and logos. DevicePolicyManager.EXTRA_PROVISIONING_MAIN_COLOR customizes flow color. DevicePolicyManager.EXTRA_PROVISIONING_LOGO_URI customizes the flow with a corporate logo. Android 7.0 now offers Vision Settings directly on the Welcome screen for new device setup. This makes it much easier for users to discover and configure accessibility features on their devices, including magnification gesture, font size, display size, and TalkBack. With these accessibility features getting more prominent placement, your users are more likely to try your app with them enabled. Make sure you test your apps early with these settings enabled. You can enable them from Settings > Accessibility. Also in Android 7.0, accessibility services can now help users with motor impairments to touch the screen. The new API allows building services with features such as face-tracking, eye-tracking, point scanning, and so on, to meet the needs of those users. For more information, see the reference documentation for GestureDescription. Direct boot improves device startup times and lets registered apps have limited functionality even after an unexpected reboot. For example, if an encrypted device reboots while the user is sleeping, registered alarms, messages and incoming calls can now continue to notify the user as normal. This also means accessibility services can also be available immediately after a restart. Direct boot takes advantage of file based encryption in Android 7.0 to enable fine grained encryption policies for both system and app data. The system uses a device-encrypted store for select system data and explicitly registered app data. By default a credential-encrypted store is used for all other system data, user data, apps, and app data. At boot, the system starts in a restricted mode with access to device-encrypted data only, and without general access to apps or data. If you have components that you want to run in this mode, you can register them by setting a flag in the manifest. After restart, the system activates registered components by broadcasting the LOCKED_BOOT_COMPLETED intent. The system ensures registered device-encrypted app data is available before unlock. All other data is unavailable until the User confirms their lock screen credentials to decrypt it. For more information, see Direct Boot. Android 7.0 introduces key attestation, a new security tool that helps you make sure that the key pairs stored within a device's hardware-backed keystore properly protect the sensitive information that your app uses. By using this tool, you gain additional confidence that your app interacts with keys that reside in secure hardware, even if the device running your app is rooted. If you use keys from the hardware-backed keystore in your apps, you should use this tool, particularly if you use the keys to verify sensitive information within your app. Key attestation allows you to verify that an RSA or EC key pair has been created and stored in a device’s hardware-backed keystore within the device’s trusted execution environment (TEE). The tool also allows you to use an off-device service, such as your app's back-end server, to determine and strongly verify the uses and validity of the key pair. These features provide an additional level of security that protects the key pair, even if someone roots the device or compromises the security of the Android platform running on the device. Note: Only a small number of devices running Android 7.0 support hardware-level key attestation; all other devices running Android 7.0 use software-level key attestation instead. Before you verify the properties of a device's hardware-backed keys in a production-level environment, you should make sure that the device supports hardware-level key attestation. To do so, you should check that the attestation certificate chain contains a root certificate that is signed by the Google attestation root key and that the attestationSecurityLevel element within the key description data structure is set to the TrustedEnvironment security level. For more information, see the Key Attestation developer documentation. In Android 7.0, apps can customize the behavior of their secure (HTTPS, TLS) connections safely, without any code modification, by using the declarative Network Security Config instead of using the conventional error-prone programmatic APIs (e.g. X509TrustManager). Custom trust anchors. Lets an application customize which Certificate Authorities (CA) are trusted for its secure connections. For example, trusting particular self-signed certificates or a restricted set of public CAs. Debug-only overrides. Lets an application developer safely debug secure connections of their application without added risk to the installed base. Cleartext traffic opt-out. Lets an application protect itself from accidental usage of cleartext traffic. Certificate pinning. An advanced feature that lets an application limit which server keys are trusted for secure connections. For more information, see Network Security Config. By default, apps that target Android 7.0 only trust system-provided certificates and no longer trust user-added Certificate Authorities (CA). Apps targeting Android 7.0 (API level 24) that wish to trust user-added CAs should use the Network Security Config to specify how user CAs should be trusted. Android 7.0 introduces APK Signature Scheme v2, a new app-signing scheme that offers faster app install times and more protection against unauthorized alterations to APK files. By default, Android Studio 2.2 and the Android Plugin for Gradle 2.2 sign your app using both APK Signature Scheme v2 and the traditional signing scheme, which uses JAR signing. Caution: If you sign your app using APK Signature Scheme v2 and make further changes to the app, the app's signature is invalidated. For this reason, use tools such as zipalign before signing your app using APK Signature Scheme v2, not after. For more information, read the Android Studio documents that describe how to sign an app in Android Studio and how to configure the build file for signing apps using the Android Plugin for Gradle. In Android 7.0, apps can use new APIs to request access to specific external storage directories, including directories on removable media such as SD cards. The new APIs greatly simplify how your application accesses standard external storage directories, such as the Pictures directory. Apps like photo apps can use these APIs instead of using READ_EXTERNAL_STORAGE, which grants access to all storage directories, or the Storage Access Framework, which makes the user navigate to the directory. Additionally, the new APIs simplify the steps a user takes to grant external storage access to your app. When you use the new APIs, the system uses a simple permissions UI that clearly details what directory the application is requesting access to. For more information, see the Scoped Directory Access developer documentation. In Android 7.0, the user can press Meta + / to trigger a Keyboard Shortcuts screen that displays all shortcuts available both from the system and from the app in focus. The system retrieves these shortcuts automatically from the app’s menu if the shortcuts exist. You can also provide your own fine-tuned shortcuts lists for the screen. You can do this by overriding the onProvideKeyboardShortcuts() method. Note: The Meta key is not present on all keyboards: on a Macintosh keyboard, it is the Command key, on the Windows keyboard, it is the Windows key, and on the Pixel C and the Chrome OS keyboards, it is the Search key. To trigger Keyboard Shortcuts Helper from anywhere in your app, call requestShowKeyboardShortcuts() from the relevant activity. Android 7.0 introduces the Custom Pointer API, which lets you customize the appearance, visibility, and behavior of the pointer. This capability is especially useful when a user is using a mouse or touchpad to interact with UI objects. The default pointer uses a standard icon. This API also includes advanced functionality such as changing the pointer icon's appearance based on specific mouse or touchpad movements. To set a pointer icon, override the onResolvePointerIcon() method of the View class. This method uses a PointerIcon object to draw the icon that corresponds to a specific motion event. Performance can fluctuate dramatically for long-running apps, because the system throttles system-on-chip engines as device components reach their temperature limits. This fluctuation presents a moving target for app developers creating high-performance, long-running apps. To address these limitations, Android 7.0 includes support for sustained performance mode, enabling OEMs to provide hints about device-performance capabilities for long-running apps. App developers can use these hints to tune apps for a predictable, consistent level of device performance over long periods of time. App developers can try out this new API in Android 7.0 on Nexus 6P devices only. To use this feature, set the sustained performance window flag for the window you want to run in sustained performance mode. Set this flag using the Window.setSustainedPerformanceMode() method. The system automatically disables this mode when the window is no longer in focus. Android 7.0 adds platform support and optimizations for a new VR Mode to let developers build high-quality mobile VR experiences for users. There are a number of performance enhancements, including access to an exclusive CPU core for VR apps. Within your apps, you can take advantage of intelligent head-tracking, and stereo notifications that work for VR. Most importantly, Android 7.0 provides for very low latency graphics. For complete information about building VR apps for Android 7.0, see the Google VR SDK for Android. In Android 7.0, print service developers can now surface additional information about individual printers and print jobs. You can set an icon from a resource ID by calling setIconResourceId(). You can show an icon from the network by calling setHasCustomPrinterIcon(), and setting a callback for when the icon is requested using onRequestCustomPrinterIcon(). In addition, you can provide a per-printer activity to display additional information by calling setInfoIntent(). You can indicate the progress and status of print jobs in the print job notification by calling setProgress() and setStatus(), respectively. The Frame Metrics API allows an app to monitor its UI rendering performance. The API provides this capability by exposing a streaming Pub/Sub API to transfer frame timing info for the app's current window. The data returned is equivalent to that which adb shell dumpsys gfxinfo framestats displays, but is not limited to the past 120 frames. You can use the Frame Metrics API to measure interaction-level UI performance in production, without a USB connection. This API allows collection of data at a much higher granularity than does adb shell dumpsys gfxinfo. This higher granularity is possible because the system can collect data for particular interactions in the app; the system need not capture a global summary of the entire app’s performance, or clear any global state. You can use this capability to gather performance data and catch regressions in UI performance for real use cases within an app. To monitor a window, implement the OnFrameMetricsAvailableListener.onFrameMetricsAvailable() callback method and register it on that window. The API provides a FrameMetrics object, which contains timing data that the rendering subsystem reports for various milestones in a frame lifecycle. The supported metrics are: UNKNOWN_DELAY_DURATION, INPUT_HANDLING_DURATION, ANIMATION_DURATION, LAYOUT_MEASURE_DURATION, DRAW_DURATION, SYNC_DURATION, COMMAND_ISSUE_DURATION, SWAP_BUFFERS_DURATION, TOTAL_DURATION, and FIRST_DRAW_FRAME. In previous versions of Android, your app could use the Storage Access Framework to allow users to select files from their cloud storage accounts, such as Google Drive. However, there was no way to represent files that did not have a direct bytecode representation; every file was required to provide an input stream. Android 7.0 adds the concept of virtual files to the Storage Access Framework. The virtual files feature allows your DocumentsProvider to return document URIs that can be used with an ACTION_VIEW intent even if they don't have a direct bytecode representation. Android 7.0 also allows you to provide alternate formats for user files, virtual or otherwise. For more information about opening virtual files, see Open virtual files in the Storage Access Frameworks guide.